A 2009 world survey published in "Biological Conservation" found that one in 10 species of dragonfly and damselfly, which compose the Odonata order, is endangered to the point of being threatened with extinction. 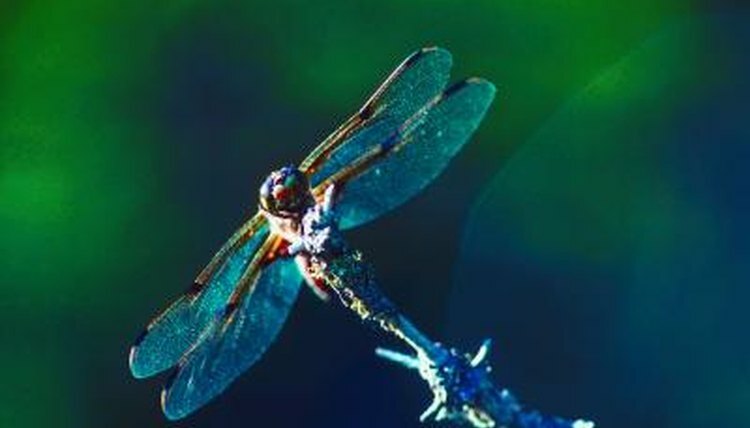 Dragonflies face threats from habitat destruction, namely the decrease in fresh water in their natural habitats, and from human interference. Because of their beauty, they are popular with collectors. The United States is home to plenty of dragonfly species, but just one, the Hines emerald dragonfly (Somatochlora hineana), is rare. It exists only in small populations scattered around Illinois and Wisconsin. The main threat to this eye-catching green and yellow dragonfly is urbanization. The continued impingement of urban development onto the Hines emerald’s natural habitat is making it impossible for the species to thrive. No other dragonfly species native to the North America, including Canada and Mexico, are known to be threatened or rare. The wetlands of South America are home to a variety of Odonata species, but none of known to be rare or vulnerable. Africa, home to 703 species of dragonfly, is where endangerment of the Odonata order is most pronounced. Of that 703, 39 are vulnerable, 16 are endangered and 18 critically endangered. Endangered or critically endangered types of dragonfly here include Calopteryx exul, native to Algeria, and Notogomphus cottarellii of Ethiopia. Umma declivium of Tanzania, Metacnemis valida of South Africa, Pseudagrion bicoerulans of Kenya and Chlorocypha centripunctata of Cameroon are listed as vulnerable. A continuation of current trends for habitat destruction and degradation could see these species become extinct within our lifetime. Mining and damming in the south of the continent is drawing water away from the dragonfly’s natural wetland habitats. Europe is home to 138 species of dragonfly, of which 15 percent are considered threatened in some way. Delphi Goldenring (Cordulegaster helladica) is critically endangered, while the Cretan Spectre (Boyeria cretensis), faded pincertail (Onychogomphus costae), Buchholz’ goldenring (Cordulegaster helladica), Greek goldenring (Cordulegaster helladica) and blue-eyed goldenring (Cordulegaster insignis) are all endangered. Habitat destruction, increasingly hot and dry summers, and lack of water are three main threats to European dragonfly populations. Libellago greeni, Tetrathemis yerburyii, Mortonagrion ceylonicum, Elattoneura caesia and Tetrathemis yerburyii, all from Sri Lanka, are endangered. Pseudagrion microcephalum of Malaysia is also listed as endangered. Japan remains rich with dragonfly species, even in culture: “Akitsu shima,” an ancient name for Japan, means Odonata Island. Japan's paddy fields and abundant wetlands provide stable habitats. Australia’s iconic giant dragonfly (Petalura giganta) is considered endangered due to the declination of its peat bog habitat.